Remember my recent feature of a new favorite salon? 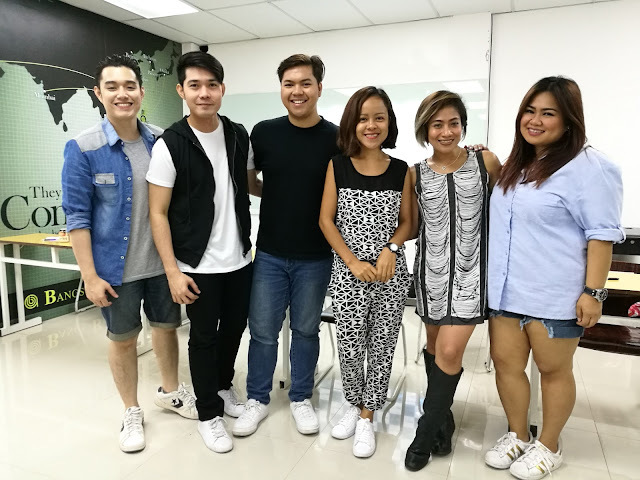 It was in my recent visit at T&J Salon for the much-needed hair treatment when I met the group band, 5th Gen. A Filipino pop singing group established on September 5, 2014 under Vega Entertainment Productions. They are being managed by Charie L. Vega. The group is composed of world champions and multi-medalists from the international talent competition called World Championships of Performing Arts (WCOPA). 5th Gen composed of three boys - Reymond Sajor, Rhap Salazar, Rj Buenagua and two girls, Marielle Mamaclay and Lady Onnagan. 5th Gen performed at T&J during its special event where I was also invited. Why I'm not surprised when T&J Salon chose them to be their newest brand ambassador. These Pinoy singers were very talented and great performers. I was invited during their contract signing. Mr. Sky Park, President of Bangs Prime Salon and Jay of T&J Salon were present during this important day for 5th Gen.
To Mr. Sky: Why did you choose 5th Gen to be T&J's brand ambassador? Mr Sky: 5th Gen is very talented. More than that they have a heart and that's what we are looking for. Me to 5th Gen: Would you like to sing a Korean song or perhaps translate a Korean song into Tagalog version in the future? 5th Gen: Yes, we are excited to do that. But now we are more than excited to share our first single entitled, Contagious. The song was composed by Italy-based Simone Ermacora and New York-based lyricist-rapper Theory. Watch this short video with 5th Gen singing "Let This Be Our Prayer"
Listen to the music of 5th Gen by visiting their Facebook Page here. 5th Gen can sing a wide variety of genre, including R&B, Broadway, and ballads. Congratulations to T&J Salon and 5th Gen. I can't wait to see you perform Korean songs as well. Cheers!